This intimate wedding took place at the Bedford Village Inn, NH. The couple had kept everything relaxed and informal and were more focussed on the actual marriage than on the trappings of the celebration. This led to a most elegant event and attention to every small detail was apparent. Small and tasteful programs and place cards, thoughtful seating arrangements and comfortable surroundings. We performed the ceremony at the front of the room, with no processional. The couple chose to have everyone in their seats and in place of the processional they played the inspirational piece ‘You lift me up’ via cd. As the last notes drifted away the three of us walked to the table and the couple each lit a candle. I talked a little about marriage and read a little, then their son gave the scripture reading. [side note: this young man will inspire people of faith for many years I am sure] Personal vows followed, and then the lighting of the unity candle from the two candles previously lit. As this was done, another son gave the blessing and we pronounced. I was honoured to be included in the reception and I was very happy to be seated with the two sons who had read for us and other family members. I found them to be fun, welcoming and entertaining. The food served by the Inn catering team was honestly the best I have ever eaten. I eat a lot of ‘wedding food’ as you can imagine, and the bar has been set very high indeed. A fresh artisan salad, fillet mignon with pomme puree, and a triple chocolate gateau with dipped strawberries was my choice, but there were two other selections of each course, and from the reactions of my table companions, each was equally delectable. The company was witty and amusing, the family was welcoming and friendly and the whole evening was a wonderful experience. I took my leave and went home smiling a big Cheshire Cat grin. I felt like I had been to dinner with friends. And just a note here, the staff at the Inn are professional, skilled and most of all approachable. The server at our table let no thing go unnoticed and dealt with every request as if he had anticipated it all along. Kudos to BVI! Thanks for a wonderful evening and congratulations Suzanne and Philip! PS – Waves to all the young Jedi I met, May the force be with you! 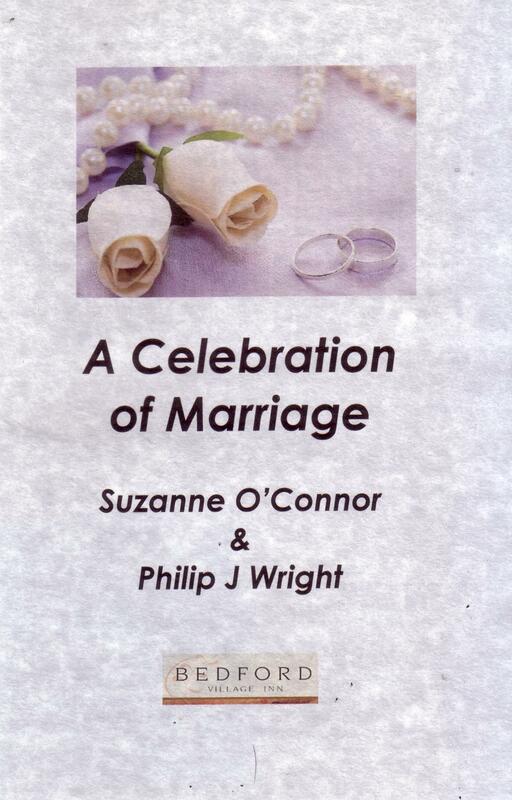 Suzanne and I wanted to thank you for the beautiful wedding ceremony you performed for us. Everything was perfect! In fact, we don’t often use that word (perfect), but the entire night went just as we envisioned… and it was perfect! Your help with the boys, and in coordinating things with the BVI staff were extra touches that were greatly appreciated. I am sorry with all the confusion during picture taking time that we were not able to say “good bye.” But we wanted to let you know how much we were inspired and encouraged by your words, and the wonderful job you did officiating our special day. Many thanks! And God bless!